Amanda is such a sweet girl and has a fun blog! She hosts a great link party on Sundays that you will have to check out! She is going to share a delicious recipe with us today! Take it away Amanda! Hello!I am so excited to have the opportunity to do a guest post! I always love sharing my recipes, hence why I have a blog, but I love even more when I get to guest write somewhere else! My name is Amanda and my blog is The Sweet Details. I also have a life style blog called Captive Creativity. I’ve been blogging for over 2 years now and love it. I was finding I was posting a lot about food so I decided a few months ago that I’d start up a second blog and The Sweet Details was born.I love trying new things but I find I get a little stuck with what I know or what I know has worked! I decided that I needed to get myself out of my box so I am making myself bake through a whole book and after that I’m going to cook my way through another book. It’s been a lot of fun and I’ve found so wonderful recipes I love but would have never tried if I hadn’t been doing this. (That series is called Baking My Way if you want to check it out! )I guess my sort of moto is “I’ll try everything once” and “Peace behinds with a smile”. I try to keep things simple in life and you’ll notice that flows into my cooking and baking. I try to post things that everyone could make and recipes that don’t have 50 ingredients!I hope you like this post! Happy creating! I have a small ice cream maker (1 quart with using both bowls) so I have a little bit of a hard time finding recipes that are sized right for my machine. 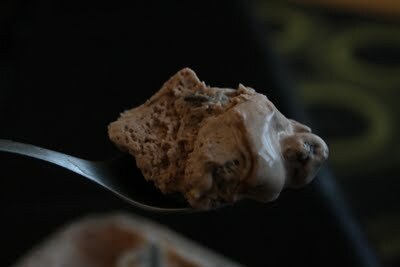 I also really wanted a Rocky Road ice cream recipe but I couldn’t find any that I liked so I made one! This recipe makes 1/2 a quart so it’s the perfect small serving for 2 or the indulgent serving for one! In a medium bowl, whisk the milk and granulated sugar until the sugar is dissolved. Stir in the heavy cream and vanilla to taste. Stir in cake mix, making sure there are no lumps. Pour mixture into the freezer bowl and let mix until it has thickened (about 15-25 minutes). Add Rocky Road pieces and let mix until pieces are well mixed in. 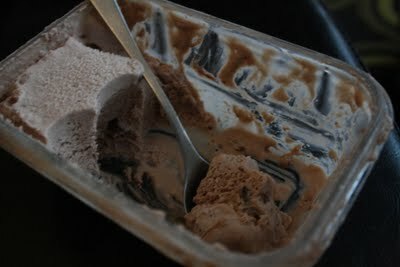 Remove ice cream from freezer bowl and place into a separate container. Place freezer bowl and the ice cream into the freezer to further harden. Amanda, this is a great recipe to try out. Simple, yet different!! 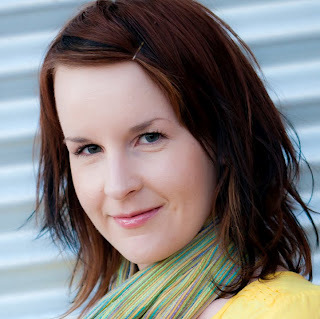 You are so lucky to get a chance to write a guest post at one of my favourite blogs!! THIS LOOKS DELICIOUS! An easy way for me to make ice cream, yay! Now I want icecream. Perfect treat to beat the heat we are dealin with! Happy Wednesday! we love making ice cream in our ice cream maker as well. do you think this recipe would work out doubled? i have a foodblog too. check it out. I'm hoping to buy a Cuisinart ice cream maker this week! There is so much talk lately on-line about homemade ice cream that I had to jump on the band wagon. :) Plus, one of my kids is seriously allergic to peanuts which makes finding truly tasty, decadent ice cream pretty much impossible to find. This recipe (minus the nuts) sounds perfect!! Thanks so much! Hello from TriedandTasty, what a sweet surprise to find your lovely comment! You have GOT to try the Candy & Caramel Apple Pie. We dug into it tonight at my moms birthday party and it is just as divine as it looks! I haven't spent too much time on the site yet - but trust me I will. I am about to become your newest follower! Thanks for following me! I'm looking forward to being blogging buddies :) Random question for you though, how did you find me?! oh ladies, as i read this post i did i'm eating cherry frozen yogurt i made! ha ah it's the best thing for summer! I thought its the end of it. You surprised us so much.